2 How to Buy the Best OBD2 Scanner – Which? An OBD2 diagnostic tool is a great addition for every car passionate, amateur or professional mechanic. This tools will allow you to check your car’s performance in real-time. Not only will the best OBD2 scanner display the data clearly, but it will also create easy to understand graphs you will be able to save. This data can be used by tuners to increase their car’s performance. Read the following OBD2 scanner reviews to find out which are the best models available on the market today and make sure you read the buying guide to learn how to properly use one. This is a really practical and reliable tool to diagnose your car engine. With FOXWELL’s code reader you will get the perfect product to identify the real condition of your car even before you realize there is one. There are some very convenient and up to the point features which will help you with your car diagnostic procedures. You can monitor the exhaust gas recirculation, check the status of your O2 sensors and respectively show you which one is bad, and many more. In addition, this product shows live data in text and graph, so you can spot the fault right away. And in case that you cannot read the information shown on your diagnostic tool, your device can record these PIDs and you will be able to print it and show it to your trusted car mechanic. But remember that you can’t work on ABS or air bag system since this code reader works with the engine parameters. 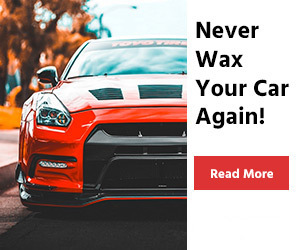 If you still do not know whether your vehicle will be compatible with this unit, make sure to check whether there is a standardized 16-cavity connector in your car. Another thing to get in advance to save you the trouble is a Windows 10 software on your computer as MACs will not meet the diagnostic tool’s specifications. Innova’s 3160 scan tool was designed by engineers to read and interpret all the “Check Engine” light warnings on cars, minivans, light trucks, and SUVs produced since 1996. The tool is able to diagnose ABS and STS codes of most car models produced by Ford, GM, Toyota, Chrysler, and Honda after 1996. This tool features a unique patented screen display and a LED display for drive cycle verification and for quick emissions readiness check. It is able to communicate with all OBD2 protocols and provide valuable live data. The tool is easy to install and use. All you need to do is to plug the diagnostic tool in the car’s DLC port, connect the tool to a Windows-operated computer, download the diagnostic software on your computer and run it. After running the software you’ll be able to interpret all the OBD2 codes. A great feature of this model is the customer help and support. 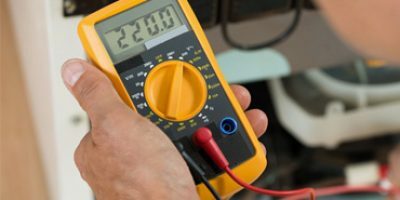 If you’re not sure how to interpret some data, you can simply visit Innova.com where you can find RepairSolutions. This page is full of helpful tech tips and advice. Once you connect the device to a PC with an Internet connection, you’ll also be able to update the software. 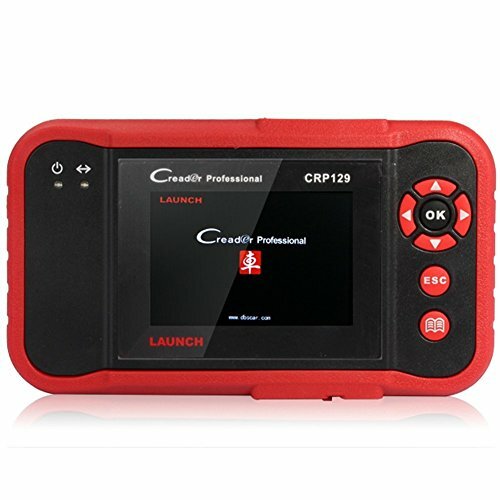 Launch Tech’s CRP129 scan tool is able to read and clear all the codes connected to the Engine, ABS, Airbag (SRS), or Transmission (A/T) systems. Not only that, but this small tool is able to retrieve more data from these systems than other models on the market. This scan tool can be used with great reliability on most Domestic, Asian and European models manufactured after the 1st of January 1996. Unlike most models, this tool is able to check and reset the Electronic Parking Brake (EPB), Oil Service Light, and Steering Angle Sensor (SAS) codes that might appear on your dashboard. The first time you try to launch the tool might take some time, so you have to be patient. This patience will be rewarded because after the install you will be able to use the latest update of the software, with more features than the basic one. Once the first software download is completed, it will connect and launch faster. You will still be able to make further free updates if any appear. This scan and diagnostic tool works well, just as advertised. It has a fast response time. OBD checks can take some time with other models, but this one completes them quickly and thorough. Actron’s CP9690 scan tool is both easy to use and easy to read. The scanner offers advanced data, like manufacturer specific DTCs, or even to record and playback any stored information and print it through a PC. This model will cover all ABS and SRS codes from most vehicles developed between 1996 and 2013 by Ford, GM, Nissan, Honda, Chrysler, Hyundai, and Toyota. It is compatible with all OBD2 and CAN vehicles produced after 1996, OBD2 compliant vehicles developed between 1994 and 1995, and OBD1 vehicles developed between 1984-1995 by Ford, GM, Toyota, and Chrysler. This tool has a hotkey that allows you to access a database made out of over 26 million verified fixed for the cause that made the “Check Engine” light to illuminate. Once you check the cause, the hotkey will also connect you with a solution to your particular problem. These fixes are specific to the vehicle’s make, year, model, and engine. This is a great feature if you want to make your own repairs or if you want to help a friend. You don’t need to take the car to a mechanic any longer, all you need is to buy and replace the faulty part and the car is fixed. 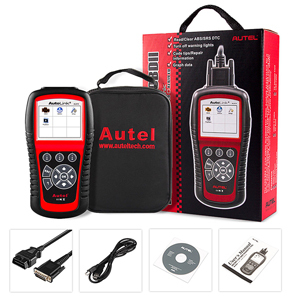 Autel’s car code reader does all the standard diagnostics but there are some features that definitely set it apart from the rest products in its class. With this unit you will be able to read and erase codes, use the O2 sensor test and get the I/M readiness status of your car. Moreover, this diagnostic tool will read the faults of your vehicle and display them on the screen for no more than 30 seconds. 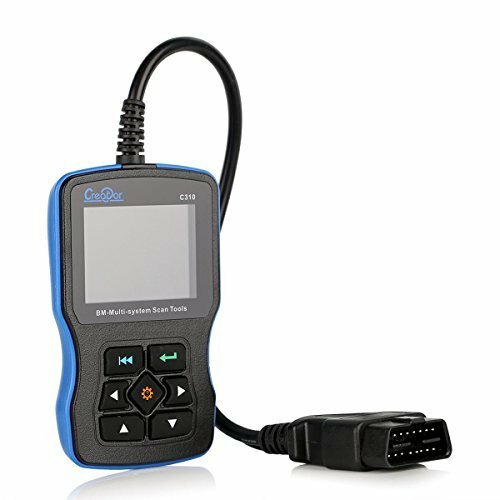 With such a fast car code reader, you will not waste your time wondering what is wrong with your car. What is more, you will be able to use this car code reader with any vehicle from 1996 and up, no matter its country of origin. A top-notch feature of this diagnostic tool is that you can read your ABS and Airbag car codes. And in addition, all the code definitions are stored in the device’s code library, so you will save time to look the codes up on the Internet. Also, the software can be updated for the latest version, so remember to do that right away when you get this diagnostic tool. A good idea would be if the manufacturer has thought of a micro SD card adapter to include in the package. PROVIDE : Visual indication Reads and displays freeze frame data. Read and display pending DTCs. Innova’s 31403 scan tool was designed by technicians to read and interpret enhanced and transmission diagnostic codes in all OBD2 vehicles, produced since 1996, and some of the most popular models produced between 1981 and 1995, in the OBD1 category. This product is able to interpret generic codes like P0, P2, P3 and U0, manufacturer specific codes like P1, P3, and U1, global, permanent and pending codes, as well as the particular code that caused the “Check Engine” light to illuminate. The tool is able to record, playback and display OBD2 live data graphs. It also allows you to access the trouble code definitions, see full diagnostic reports, the most likely probable causes, recall any stored information and TSB’s. Once the problem has been identified this model will access a database and search the best fix for your problem. It also has a Freeze Frame Data feature which will allow it to make a snapshot every time the “Check Engine” light appears. This will allow you to check the status of the vehicle at the exact moment a component did not work properly. This way you’ll be able to replace the broken component by yourself, without going to the mechanic. 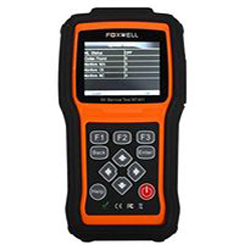 Foxwell’s scan tool was designed to read and interpret codes from over 32 international manufacturers. It is compatible with all OBD2 cars, light trucks, minivans and SUVs produced after the 1st of January 1996. The tool does everything other models do and more. It is able to reset your “Check Engine” light and reveal the code that leads to its appearance. It is also able to reset the “Oil Inspection” and “Oil Service” lights. The tool can set your Inspection Service intervals, and the Inspection Mileage interval, as well. On some vehicles, you can even use it to reset the airbags. This model is easy to use. It has an ergonomic housing with a big screen. The screen offers more menus you can use to select the desired operations. After reading and interpreting the codes, the tool takes all the available data and makes easy to interpret graphs. Sometimes it will even merge two or more graphs for a more intuitive diagnosis. The tool comes with a multilingual menu so most people will be able to use it without any kind of trouble. It also has an SD memory card you can use to backup your data. The software can be updated if you connect the tool to a PC with Internet connection. 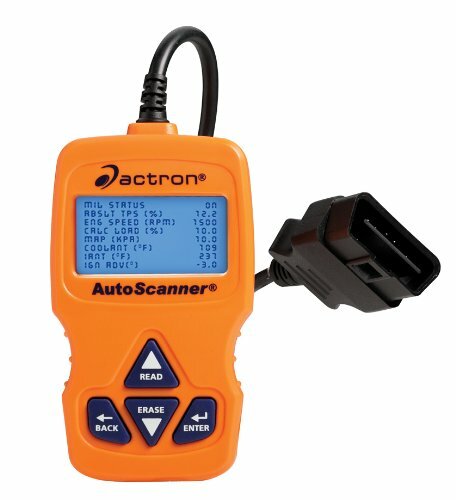 Actron’s CP9575 scan tool is compatible with all vehicles produced after 1996 that have OBD2 and CAN. 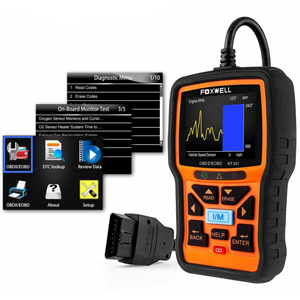 The tool is not only capable of reading and displaying generic and manufacturer-specific diagnostic codes, but it is also capable of advanced features. These features will allow you to receive real-time data, freeze frame data, drive cycle mode, and emissions checks. This model is capable of displaying the status of your vehicle’s inspection monitor and that of the maintenance monitor, which have to work properly for your vehicle to pass the mandatory emissions tests. This tool’s software can be updated regularly over the Internet so any new codes will be included in its database. The codes are not only stored there for recognition. They are also interpreted and defined. This way, any time the “Check Engine” light illuminates, you’ll be able to learn why very quickly. The device’s software can be changed, so it can be accessed in either English, Spanish, or French. This model offers several great features. You can use it to read and display the emissions levels, your pending DTCs, and the freeze frame data. This data will display the exact moment when something went wrong and the “Check Engine” light was displayed. Innova’s 3100 scan tool can reveal the cause of the “Check Engine” light turning on for every vehicle model, domestic or foreign built after 1996. The tool is also capable of reading, interpreting and clearing ABS light trouble codes for vehicles produced by Ford, GM, Toyota, or Chrysler. Not only that, but this model can also reveal which code might make the ABS or “Check Engine” light turn on, so you can take preventive action. The scan tool will allow you to see if the car, light truck, minivan, or SUV you’re checking can pass the mandatory emissions test. If the result is negative, you can fix everything by yourself, without going to a professional. This will dramatically reduce the cost of the repair. The tool is easy to use. 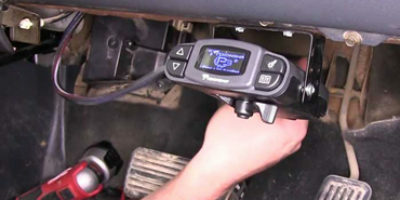 After you get the box, connect the diagnostic tool to your car and to a Windows-operated computer. Download the diagnostic software on your computer and run it. Once you run the software, you’ll be able to access all your car’s data in real-time and receive valuable information. If you don’t know how to interpret the received information, you can check online on Innova’s website for technical tips and advice. 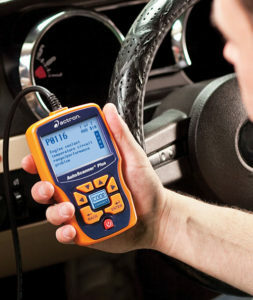 PowerLead’s scan tool was designed to be compatible with all vehicle models that support OBD2. This includes all cars developed after the 1st of January 1996, but some of them, which were produced between 1997 and 2000, might need a 20-pin adaptor to connect to this scan tool. This adaptor is not included in the box, but it’s easy to find one online. The device is easy to use and it can be used to read, interpret and clear trouble codes. It can read all general codes, most manufacturer-specific codes and a limited number of ABS trouble codes. The ABS codes it can read and clear must come from a vehicle produced by Toyota, Ford, GM, or Chrysler. This model is able to display a valuable live data stream. Some of the data provided can be displayed as graphs for easier interpretation. Once a problem is detected, the device will provide a clear adaptation of its cause and effects. You can also use it to reset the “Engine Oil” light if it’s illuminated on your dashboard. The product is simple to operate and its small size allows you to do it with only one hand at any given time. This allows you to use both the PC and the scanner at the same time. Actron’s CP9580A scan tool is compatible with all OBD2 and CAN cars, SUVs, minivans and light trucks produced after the 1st of January 1996, including Asian models. The tool is capable of reading all domestic ABS codes, and those from Nissan, Hyundai, Honda, and Toyota vehicles produced between 1996 and 2009, as well. Once you connect the scan and diagnostic tool to your car, it will read and interpret why the “Check Engine” light is turned on. Once it identifies the problem, this model will access a database of over 4.6 million fixes specific to your particular mark, model, year and engine. This model is capable of displaying OBD2 generic and manufacturer specific codes, it is able to define those codes, both on its screen and on a PC. It is also able to read and display the live engine data and make graphs out of it, for easier understanding, diagnose trouble codes, reveal pending trouble codes, and make a snapshot of the vehicle’s data right at the moment the fault appeared. A great feature of this model is the prioritized troubleshooting options. You will be able to follow the list without any trouble, and if the first option is not suited for your situation, you can always choose another. 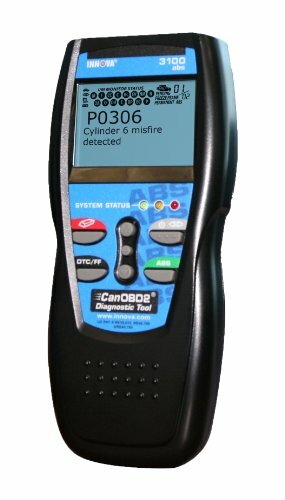 Innova’s 31703 scan tool is designed to retrieve diagnostic codes from all OBD2 car models, those manufactured after the 1st of January 1996, and from some popular OBD1 vehicles, manufactured between 1981 and 1995. 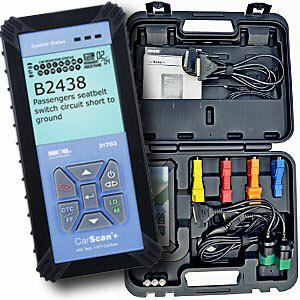 The tool is able to read and erase ABS and SRS codes on most vehicles produced by GM, Honda, Chrysler, Toyota, or Ford. Due to the advanced technology employed, this tool is able to record and display the live data straight as easy to follow graphs. This technology also allows the scan tool to display a snapshot of the vehicle’s condition at the exact moment when the code was set. This way, even though some codes were not activated, you’ll be able to check all the systems that were functioning near their maximum capacity or breaking point. This might help you replace some parts even before they break down. This product is easy to use. You just need to plug it in the car and the rest will be straightforward and intuitive. When you have difficulties reading or interpreting a code, you can check the solution online with Innova’s technicians. This is great if you want to start making your own repairs, it will save you a lot of money in the long run. How to Buy the Best OBD2 Scanner – Which? If you’re passionate about cars and you like working on them yourself, you need an OBD2 scanner. This device is guaranteed to make your life easier and more enjoyable. You can use a scanner to check why your “Check Engine” light is on and to reset it. 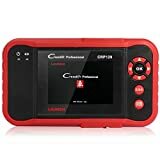 The best OBD2 scanner will not only read the trouble code that determined the light to turn on, but it will also interpret the code for you, so you’ll be able to change the faulty part all by yourself, without help from a professional. Most of the times the “Check Engine” light turns on it’s not a serious matter. Some sensor might not work properly, or a filter needs to be changed. These changes are not hard to make, even for a person without mechanical experience. Some diagnostic tools will also be able to reset your “Engine Oil” light or to change the Inspection or Maintenance intervals, but we recommend you don’t change those unless you have an informed opinion and some experience with car mechanics. If you decide to buy an OBD2 diagnostic tool, read our OBD2 scanner reviews to learn what to expect from the best models on the market, and read the following buying guide to know how you should use one. Check Engine lights usually turn on when there’s a problem with your car’s emission control system, or with the engine. But the problems are more often small rather than large ones. That’s why you should own a diagnostic scan tool. You can use one to have the codes generated by your car scanned and interpreted so you can determine the cause. You will be able to reset the light before you fix the problem. This is how you do it. This connector is usually found somewhere you can reach while seating in the driver’s seat. Some vehicles have the connector situated under the steering column, on the left or on the right. Others have the connector placed near the ashtray or under the dashboard. You should be able to identify it quickly once you see it. Once you have identified the connector, take your scanner’s cable and connect the device to your car. Turn the ignition switch to the “ON” position. Make sure you remove or turn off all accessories after doing this. After you turned off all your accessories, turn on the scanner. Once it’s turned on, press the “Read” button. Some models do not have the “Read” button, but they will have a similar one you can use. Many manufacturers use hotkeys, so if you can’t find the right button, read the instructions manual. After the scanner reads the codes, you might have to write them down in the order they appeared, if the diagnostic tool doesn’t have a memory function. You will need these codes as a reference to find out what’s wrong with your car. When you finish writing the codes, or if your device memorized them, you can erase them. If your scanner has a freeze frame function, make sure to check it before you erase the codes. This will show you the exact code that determined the Check Engine light to turn on. To erase the codes, press the “Erase”, “Clear”, or “Yes” buttons on your scanner, depending on the model. 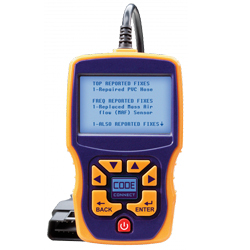 Some scanners are only able to read and interpret generic or manufacturer-specific trouble codes. But you don’t want to spend your hard-earned money on a diagnostic scanner that’s capable of doing only that. The best OBD2 scanner will be able to do more, a lot more than that. If you want to get more out of a scanner, look out for the following features. This feature will allow you to see what went wrong at the exact moment the Check Engine light turned on. This is important because once you connect a scanner to your car, several trouble codes will appear. The most important one for you is obviously the one that made the light turn on, but the scanner will interpret the data differently. If for example, the light turned on because of a light sensor, but your emissions are high, it might put the emission problem above the sensor. You will have to fix both, but the sensor will turn on the Check Engine light again soon, so it’s better to fix it first. Different lights, different sensors, different problems. Most diagnostic tools won’t be able to reset these lights for you, but some can. This is a nice feature if you want to have a clear dashboard, especially if you run a used car showroom. We suggest you don’t use these features if you don’t know what they’re about. But for amateur mechanics and professionals, these features are a great addition to a scanning tool. They might prove useful if you’re trying to sell used cars, as well. A memory card might not seem such a great feature, but having one in your device will prove very useful. You won’t have to lose time writing down the codes the scanner displays. They will be memorized in the card. Even more useful, you will be able to keep track of the codes generated by multiple vehicles over the time. This will be very useful for someone who has more cars or has to take care of a car park. Keeping track of their problems will allow you to take preventive measures, so nothing serious will be damaged. This feature will be useful for every used car salesman, amateur or professional mechanic. Damaged cars will often need their airbags replaced, but even after you replace the airbag, you still need to clear the code. If you ever had the Check Engine light turn on, your first reaction was probably to worry about your car, the safety of driving it, and the money you’re going to spend on the mechanic. But what does the light mean? Your car’s CPU is a complex machine that receives a lot of information from different sensors, so you can’t tell what’s wrong right away. The easiest way to determine what’s wrong is to have a code reader. This tool will allow you to see exactly where the error is. The first thing you need to do is to get the codes. If you want to obtain the trouble codes, you’ll need the proper tool to do it. You can find OBD2 diagnostic tools online or in auto-parts stores. Some models can be used directly from your phone through a Bluetooth connection, but the most simple and reliable are able to connect your car to a laptop through a USB cable. 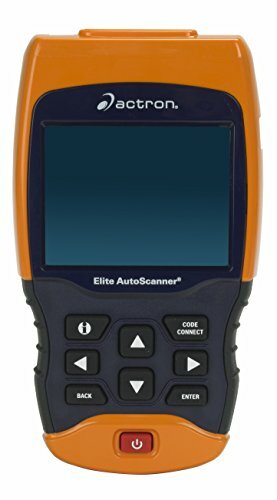 The scanning tools are designed to read and interpret certain sets of codes, so you’ll need to find the right device for your car. If your vehicle was produced before the 1st of January 1996, you will need to buy a tool that’s able to read the OBD1 set of codes. If your car was produced after this date, the device will have to be able to read the OBD2 set of codes. This code system was designed to constantly monitor your engine’s performance and your car’s emissions. 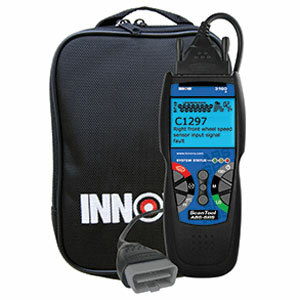 Most diagnostic tools available now on the market are able to read and interpret this system’s codes. After you buy the appropriate device you need to find your car’s Diagnostic Link Connector or DLC. The DLC is somewhat triangular and has 16 pins. You should be able to reach the DLC from the driver’s seat. It is usually located underneath the steering wheel, on the left or right side of the steering column. Some car models might have it located near the ashtray or under the dashboard. If you can’t find it, check the owner’s manual. Once you locate the DLC, you can connect your scan tool to it. After you connect it, turn the ignition to the “ON” position, but don’t start the engine. You will notice that the scanner will begin reading the data from your car’s CPU. Some scanners might light up and show some welcoming messages, while others will show a loading bar. The first time you connect a device to your car’s computer is the longest, so make sure you have patience. When the booting process is done, open scanner’s menu. You should search for “Trouble Codes” or “Codes” to open the right menu. Depending on the scanner and on the vehicle you might have to choose between systems like Engine, Transmission, Brakes, Airbag, and more. When you pick a system, you’ll be able to see two or more types of codes, again depending on the scanner. The most common codes are Active and Pending. Active codes are the ones that represent the malfunctions that turned your Check Engine light on. Having the codes active but the light off means that despite the malfunction, the code’s setting conditions have not occurred for more operations of the vehicle. Pending codes mean that the OBD2 system failed to operate the emission control system at least once. If the operation fails again, the Check Engine light will turn on and the code becomes an active one. Now that you have the codes, you need to understand what they mean, so you can make the necessary changes and repairs. Every code will begin with a letter. That letter represents the system the code is referring to. P – Powertrain. This category covers the engine, fuel system, ignition, transmission, emission, and more. It’s the largest category. B – Body. This category covers the seatbelts, airbags, power seating, and others. C – Chassis. This category covers the ABS, axles, brake fluid, and more. U – Undefined. This category of codes covers all the other aspects of your car. If for example, you have a code that looks like this P0xxx, P2xxx, or P3xxx, it’s a generic code that will apply to all vehicle makes and models. A P1xxx code will be manufacturer-specific, such as Ford, Nissan, Honda, or Toyota. The second number will tell you what system the code is referring to. P07xx is a generic code referring to the transmission system. The last two digits represent the specific problem the code is referring to. You should check an online chart for more details on each specific code. Let’s say that the code displayed by the scanning tool is P0301. This code indicates a misfire condition on the first cylinder. The letter P sets the code in the Powertrain category. The 0 indicates this is a generic code. The 3 represents the malfunctioning area is the Ignition System. The 01 reveals that the problem is a misfire condition in the first cylinder. This problem could be related to a vacuum leak, a defective plug wire, or a worn out ignition coil. The code does not point out which of the components are defective, it only indicates that the cylinder as a whole isn’t working properly. Making the right diagnosis based only on OBD2 codes takes practice. A worn out alternator, for example, might set off codes in different systems that work normally. You need to understand that the codes alone will not magically reveal what parts need to be replaced. If, on the other hand, the codes indicate a malfunctioning sensor or filter, just change it. Even if you don’t make the repairs, you will still be able to reset your Check Engine light with most scanning tools. Keep in mind that the light will only stay off for a limited amount of time. If you love to take care of your car, or if you have to take care of cars for a living, owning and using an OBD2 scanner will definitely improve the quality of your life. The best OBD2 scanner will be able to let you know which of your car’s systems has problems and will suggest the best way to fix it. Not only that, but it will also be able to turn off the Check Engine light if it’s on. If you’re interested in buying a diagnostic tool, read our OBD2 scanner reviews to find the right model for your car. Hi! I’m Tanya; I am the Service Manager at TOPDON. We specialize in professional car OBD diagnose tools. I am reaching out to you on the possibility of getting either an editorial or a video review for our featured OBD2/EOBD ArtiLink 201 Auto Code Scanner. This product checks engine error codes with O2 Sensor Test, Views Freeze Frame Data, Reads and Clears DTC. It has extensive coverage (works on all 1996 and newer OBD II and CAN compliant vehicles) and simple manipulation (One click I/M readiness for a quick check). Besides, it has exclusive OBD II diagnostics, efficient monitoring and supports multiple languages. Please find more details of the product here: https://www.amazon.com/dp/B074M6KHDH. 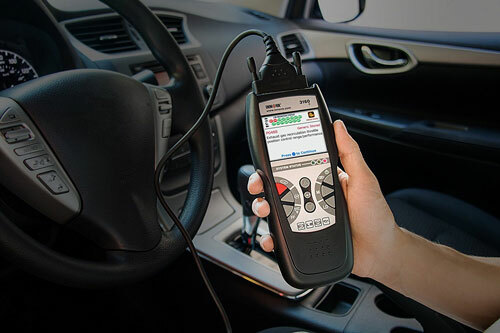 If you are interested in reviewing our latest OBD2/EOBD Auto Code Scanner, please let me know and I will send out a free sample for you to review. Business cooperation，application for adding Humzor OBD2 product into your review blog. We can send product to you for testing. More product information can be check on http://www.humzor.com.